BERLIN, Sept. 11, 2018 /PRNewswire/ -- On August 31, leading global home appliance maker Casarte showcased its iCOOK steam oven featuring moisture preservation at IFA 2018. The oven provides customized solutions for at-home chefs via the ability to select a cooking mode - Easy Life, Fun Life and Pro Life -, and is specially designed and optimized for addressing the needs of consumers in the European market. With the moisture preservation technology, the new oven can control the moisture and temperature by deploying three core systems: the "vacuum vent technology" that creates a protective cover for the steam circulating in the oven and prevents it from escaping; the "steam-assist" that maintains the moisture content at an ideal 75% and the temperature at an ideal 31°C for the fermenting of dough in the oven, assuring that the bread rises at just the right moment; and the AH dynamic heat and temperature control system, which calculates the time it takes for the temperature in the oven to rise to a certain preset level and then controls the temperature to within +/- 1°C of that preset level. The oven combines an innovative pyrolytic cleaning feature with artfully crafted designs, including a European style handle and the black stainless-steel range with the aim of enhancing both ease of use and overall aesthetics. Emma, who lives in Berlin's Mitte district, had an opportunity to bake a bread with Casarte's iCOOK steam oven. As a professional baker, she kneaded the dough deftly and quickly and then placed it into the oven. As soon as the Pro Life mode was selected, Meat Roasting and Pastries Baking, among other options, were displayed on the oven's touch screen with the required moisture and temperature matched automatically. When Emma returned to the exhibition area one hour later after having set the table, a loaf of mellow and full bread that tasted soft, glutinous and sweet came out of the oven. "I have never seen an oven with three cooking modes in the European household appliance market," Emma said. She had been looking for a new oven which can meet her needs for both cooking at home and professional baking. However, after an exhaustive search of all the local department stores and specialty shops, she found that most household ovens only have simple functions and single modes, while professional ovens were too cumbersome when it came to actual operation. The iCOOK steam oven is one of the key products in Casarte's high-end kitchen appliance suite. The suite also includes a wind-powered range hood which features a proprietary variable frequency, direct drive and double boost technology, where a large amount of lampblack or soot produced by quick-frying and deep-frying can be quickly taken up by the exhaust while avoiding blowback of the unwanted airborne particles. There is also a three-head cooker which can significantly improve the efficiency of cooking by making it easy for more than one cook to work in the kitchen at the same time, and to simultaneously handle the cooking of multiple dishes. Casarte's high-end kitchen appliance suite has now been recognized by the market and users. Casarte's kitchen appliances have maintained robust growth despite an overall slowdown in the kitchen appliance industry that started taking place earlier this year. According to data from China Market Monitor, the kitchen appliance market (including range hoods, gas cookers and disinfection cabinets, microwave, steam and toaster ovens, as well as assemblies that comprise several pieces of kitchen equipment in one unit) reached 36.9 billion yuan (approx. USD 5.4 billion) during the first five months of 2018, a decrease of 4.2 percent from a year earlier. Casarte's high-end kitchen appliance suite witnessed an increase of 224 percent during the first seven months of this year. 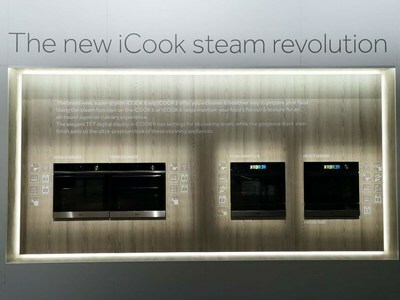 By showcasing its iCOOK steam oven at this year's IFA, Casarte has brought personalized and exclusive cooking methods to European users and upgraded its high-end baking solutions. The new lineup in large measure owes its success to the application of the Rendanheyi management model developed and deployed across the full brand portfolio of Casarte's parent, Haier Inc.